Hello again! I would like to tell you a little more about myself. There is only one word that describes my greatest strength. That word is creative. I love thinking out of the box when it comes to every aspect of my life. When I become a teacher I hope to incorporate my creativeness to make my lectures more interesting and interactive. I want the children I teach to be able to learn but at the same time have fun. I also love making decorations. I love the holidays because it allows my creative to run wild. One of my favorite hobbies is making scrapbooks for other people. 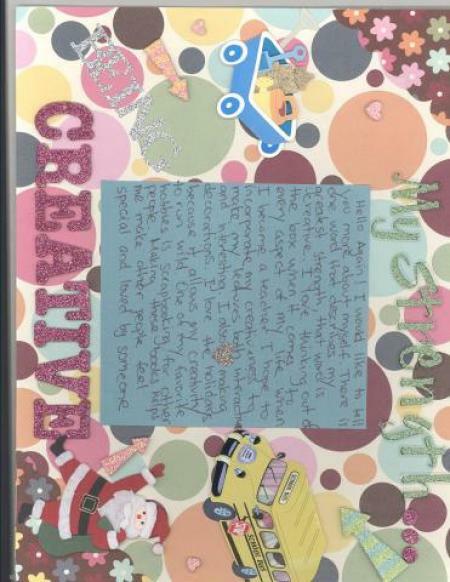 Making these scrapbooks helps me escape from the troubles of this world and at the same time make the receivers of the scrapbook feel special.